Fair. Box has some damage/ Booklet has minor water damage. Cd's are in great shape....Buy with confidence-Satisfaction Guaranteed! Satisfaction 100% guaranteed. Dionysio Aguado; Enriqué Granados; Federico Mompou; Federico Moreno Torroba; Fernando Sor; Gaspar Sanz; Isaac Albéniz;... Very Good. In very good packaging. 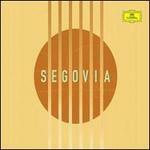 Andrs Segovia-The Segovia Collection by Andrs Segovia. Dionysio Aguado; Enriqué Granados; Federico Mompou; Federico Moreno Torroba; Fernando Sor; Gaspar Sanz; Isaac Albéniz;... New.